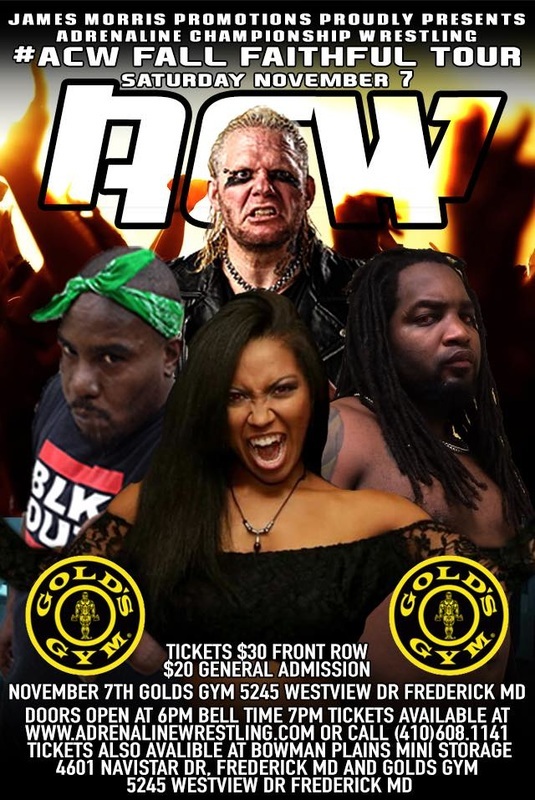 ACW made its debut in Frederick Maryland as the Fall Faithful tour rolled into town at Gold’s Gym. They were immediately greeted at the door by ECW Legend and the most decorated wrestler in WWE history Raven. The 32 time champion in ECW, WWE and WCW also provided a seminar before the show to future hopefuls wanting to break into the business. Early on Rich had no answer for the raw power of Terry falling victim to a series of shoulder blocks and tackles. The Winners attempted getting into the act with Pat Anthony distracting Terry and allowing Rich to gain an advantage. After being blinded by an eye rake Terry charged after The King and missed ramming himself head first into the ring post. Even this only momentarily stopped the big man who recovered quickly and caught Louis G Rich with a chokeslam to get the pinfall. After the match The Winners attempted to take out Terry who gave them much of the same that their partner had received during the match including a second chokeslam on Pat Anthony. Before the match an over excited fan made the first of many attempts to get into the ring but was held back by security. Sykes offered to shake hands but was met with a slap in the face by Illuminati in return. Illuminati kept the match on the ground as much as he could and controlled a lot of the action including a devastating forearm right to TJ Sykes jaw that only resulted in a two count. Illuminati hit a superkick and was stunned when Sykes absorbed the shock of the blow and immediately connected with one of his own. Illuminati was not able to recover and took the 3 count. The Black Wrestlers Matter movement has caused a lot of controversy. Desert Storm, Sidney Porter and now Doyle Day feel that they have been overlooked for opportunities and championship matches. They may have a point. However, much of their obvious talent was utilized showboating at the beginning of this match. Doyle Day was more concerned with the crowd and showing off his moves instead of locking up. However once they got to business, they proved that this group is a force to be reckoned with. Staring across the ring from them was the legend Mad Dog Buzz Striker, Bodie Williams and PJ Walker. Not an easy task for BWM. They spent a majority of the match double and triple teaming Stryker until a hot tag to PJ Walker changed the momentum. Palker was very impressive coming in as a house of fire with an outstanding aerial attack. Bodie Williams tagged in and had things under control but the referee was distracted by Porter and Storm. Day took advantage with a low blow on Williams to steal the win. Never let it be said that JD Smooth hasn’t earned his nickname as “Mr. Entertainment”. From the minute he walked the aisle along with AC Wolf, there was a running dialog with the ringside fans. Smooth is very interactive with the crowd and will tell anyone who wants to hear it how great he thinks he is. The longest reigning champion in wrestling would be his opponent on this Fall Faithful stop. ACW Light Heavyweight Champion Diaz would have Vic Ramon in his corner to counteract the presence of AC Wolf. This would be a non-title match as Smooth is not a ranked contender in ACW despite his reputation. A free for all from the beginning almost resembling a tag team match – AC Wolf and Vic Ramon were as much a part of this contest as Diaz and Smooth were both as cheerleaders and in Wolf’s case getting physically involved in the contest. The match, when not being marred by interference, was outstanding as expected. High flying and fast paced the ACW Faithful got their money’s worth. It was AC Wolf though who continually interfered taking out the Light Heavyweight Champion with a devastating maneuver that the referee couldn’t possibly have seen with all the chaos going on. Smooth then climbed to the top turnbuckle and hit a textbook Alabama Jam legdrop to get a highly disputed victory over Diaz. Hopefully ACW Commissioner Mike Ratick can make a return match with stipulations that will ensure a true one on one contest. Before the match Raven addressed the ACW Faithful. As he introduced The Vampire Kindred, Michaels Amaydo shockingly ran right past his opponent to confront the ECW legend. Raven told Amaydo that he should be more concerned with what is standing behind him. As he turned around Yana spit blood directly into his face. This caused the already confused but talented Amaydo to flip out. Both personalities – Michaels and Lars began a tirade about having blood on “them”. Eventually Amaydo was able to regroup and showed off some real wrestling skills. A potential turning point in the match saw Kindred walking the ropes only to have Amaydo pull him off into a back body drop which Amaydo turned into a bridge pinning attempt that was brilliant but Kindred was able to escape just before the 3 count. Kindred absorbed a tremendous amount of punishment but would not be denied. As Amaydo had hit him with everything he had, it was just not enough as the vampire hoisted up Michaels for a devasting F5 that no one could have survived. The ACW Tag Team Title picture has been volatile and very competitive with the championship changing hands several times recently. The Wildcardz and The Winners have been at the top of the list with Jason Radatz and Eddie Page most recently capturing the championship last month at Fright Fest at Six Flags America. Andy Vineberg invoked the rematch clause here in Frederick despite not being in attendance this evening. The champions made their way to the ring first which was a mistake as The Winners brutally attacked The Wildcardz as they walked down the aisle. The champions recovered though and as Pat Anthony attempted a flying bodypress on both of the Cardz but they caught him and press slammed him over the top rope onto the floor where his partner Rayburn was waiting. It wouldn’t be the only feat of strength in this match. Soon after connecting with an enzuguri Jason Radatz picked up the massive Rayburn and slammed him with authority. This accomplishment was not lost on the crowd at Gold’s Gym which roared its approval. The Winners were not finished though. Rayburn recovered to hit a spear on Radatz and tagged Anthony. He then distracted the referee as Pat Anthony grabbed one of the ACW championship belts and clocked Radatz over the head with it. Rayburn then made the cover and The Winners became the ACW Tag Team Champions once again. Knowing that Ruckus was the man who trained the ACW Heavyweight Champion brought something special to this match. Ruckus brought his BLK OUT partner Robbie Illuminati with him and Sicend had Riot City’s Most Wanted Jason Scythe in his corner. Ruckus started off fast gaining a couple of near falls. You could tell immediately both champion and challenger knew each other very well. What was unexpected was the presence of Illuminati and Scythe. At times both got themselves physically involved which was something that had not been anticipated. However as the action continued both the other members of BLK OUT and Riot City’s most wanted were incapacitated and made their way back to the locker room leaving both champion and challenger one on one. Ruckus took control and climbed the turnbuckle and went for the split leg moonsault. Sicend miraculously countered it and rolled up Ruckus and held him down to the mat for the 3 count and another important title defense to add to his growing legacy. After the match Ruckus grabbed the ACW Heavyweight belt, but handed it to Sicend and both shook hands in a true show of sportsmanship. Despite their troubles Pretty Ugly stood tall together on this night and dared anyone in the building to challenge them, including the fans. Local fans from Frederick jumped to their feed as ring announcer Michael Delss announced local favorites “The Loose Cannons” Butch Hess and Kid Mike as the ones who accepted the challenge. Despite a quick early showing by the hometown heroes, Dream and Ugly were ruthless and in synch despite being disqualified and having the match thrown out as Adam Ugly used the toilet seat as a weapon in an “ugly” beatdown. As the Cannons laid helpless another local team charged the ring to make the save. Pretty Ugly were shocked as the veteran tag team - The Clutch Players Bill Bain and Scott Fowler cleared the ring and declared themselves ready to challenge the 14 time tag team champions and Pretty Ugly immediately accepted. Despite the surprise Pretty Ugly still looked like a solid and sadistic unit working as a team with reckless abandon and no concern for the rulebook. Just when it looked like Pretty Ugly had things in hand, another miscommunication came about. As Adam Ugly had Scott Fowler hooked from behind, Jimmy Dream through a roundhouse punch but Fowler ducked and Dream clocked his long time tag team partner. The Clutch Players then took advantage and hit Adam Ugly with a dual suplex and both covered him for the pin. The question now is, can Pretty Jimmy Dream and Adam Ugly regroup or is the greatest team in ACW history in a free fall with no way out?